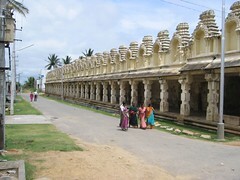 Melukote is also called as Thirunarayanapuram. It lies in the Mandya district of Karnataka. It is a set of rocky hills known as Yadavagiri. The place has a big temple named Yoganarasimha temple with a large pond called as Kalyani. September to December is the best time. Only few hotels are available at Melukote. Carrying packed food is the better option. Melukote is 120km from Bangalore. Route 1: Bangalore - Mandya - Melukote. KSRTC runs a large of number of Services through Mandya to Mysore. After reaching Mandya you can get private and KSRTC buses to reach Melukote. If you driving then at Mandya you need to turn right and travel about 40km.